The OH1, type CNP is an over hung end suction, volute casing, radially split pump with a back pullout design. 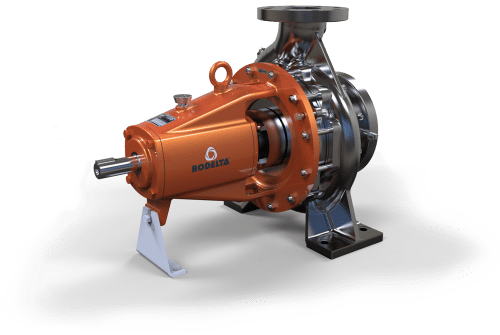 These pumps are suitable for process applications in chemical process industries and refinery for handling corrosive acids, alkalies, hydrocarbons, etc. The impellers are offered with enclosed type and semi-open type depending on the application and pump size. Their delivery size ranges from 20 mm to 350 mm. The CNP is conforming DIN 24256 (EN22858) and ISO 2858. Chemical Process Industries, Petro Chemical, Nuclear, Refinery, Paper and Power Plants, etc. Pumps suitable for handling Corrosive Acids, Alkalies, Salt Solutions, Caustics, Hydro Carbons, Oils, Thermic Fluids, Liquefied Gases, Condensates, Viscous Liquids etc. The casing has axial suction and top center line delivery. Smooth hydraulic passages ensure high efficiency. Normal design is for foot mounted pumps. Centre line mounting for special applications are also available. The impellers are of enclosed type and semi-open impellers can also be supplied. Hydraulic balancing of impellers is achieved either by back vanes or by balancing holes. The impellers are statically and dynamically balanced. Reliable fixing of the impeller on shaft is achieved by using Heli coil insert under impeller nut. To improve NPSH performance, inducer can be supplied. The shaft is supported by two antifriction bearings to take residual axial thrust and prevent axial float or radial run out. It is fully protected from the liquid handled by means of a shaft sleeve and gaskets between impeller nut, impeller hub and shaft sleeve. The stuffing box is sealed by gland packing or by cartridge type mechanical seal. Conversion from gland packing to mechanical seal is achieved by changing some standardized parts. Re-machining of stuffing box is not necessary. Stuffing box cooling is provided for operating temperature 105°C for gland packed and 140°C for mechanical seal fitted pumps. The bearings are oil lubricated. For high temperature (above 180°C) application, bearing oil cooling arrangement is provided. All pumps are provided with reinforced bearing arrangement as standard supply. Clockwise viewed from driving end. Pumps can be driven by electric motor or engine.